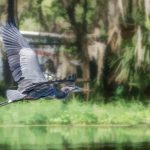 Cross Creek, located in southeastern Alachua county, is 16 miles southeast of Gainesville Florida. 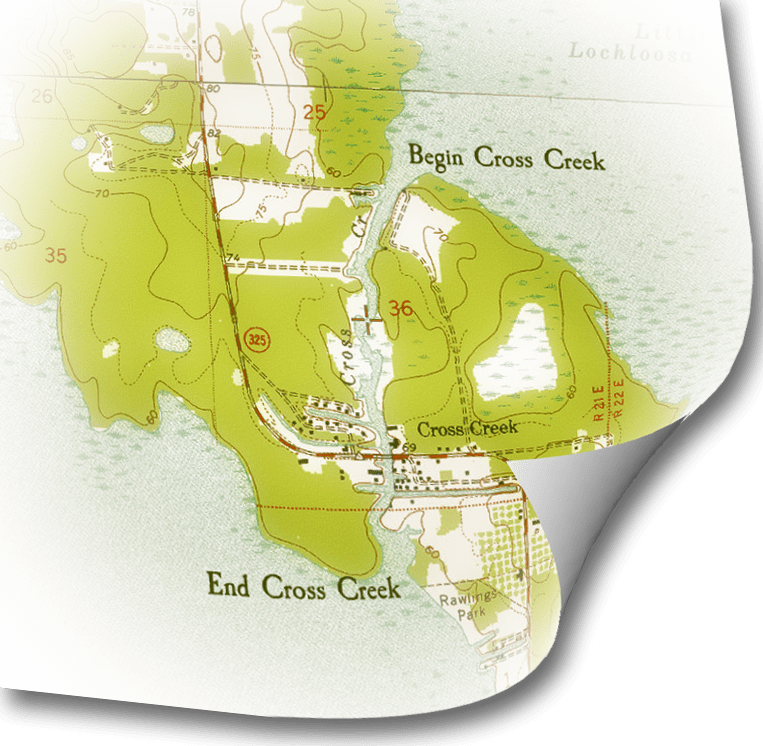 According to topographic maps, the actual creek is only 1 mile long, flowing North to South from Lochloosa Lake to Orange Lake. 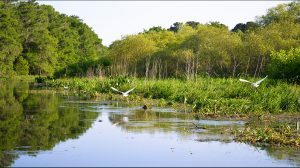 It is the abundant aquatic vegetation that obscures the actual shoreline at both ends, thus making the true length of the creek a bit ambiguous. 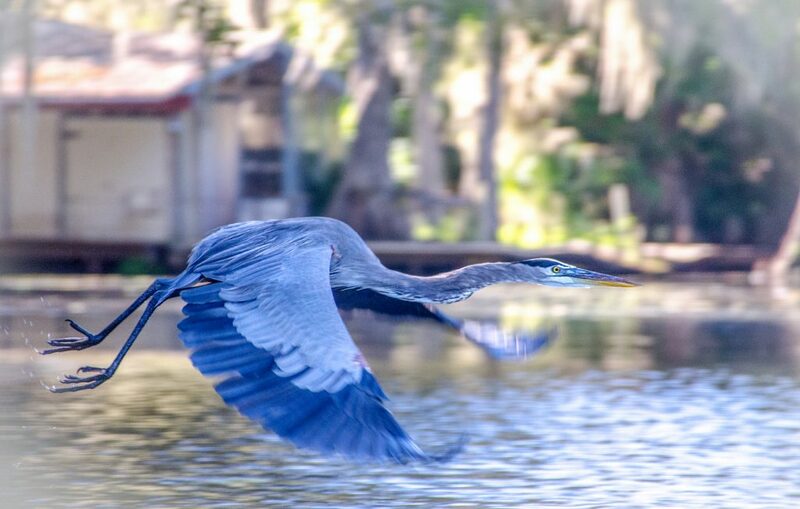 Cross Creek was designated an Outstanding Florida Waterway in 1987. The Creek, is a narrow, shallow waterway and in times of drought has dried up in years past. 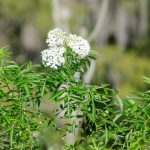 It is characterized by its many Bald Cypress trees that line the banks. Red Maples, Willows, Oaks and Ash also fill in the thick forested shoreline for most of the river. 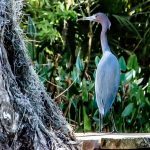 Numerous birds can be seen along Cross Creek to include Bald Eagles, Ospreys, Egrets, Herons and Moorehens. 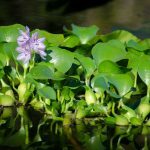 Due to the minimal flow of the creek there is an abundance of invasive aquatic plants along the length of the creek to include Water Hyacinth, Water Lettuce, Water Primrose and Dollarweed/Pennywort. See the photo gallery below. 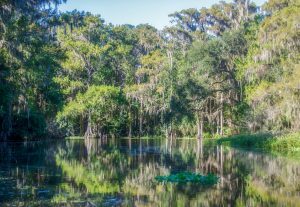 Cross Creek became well known due to the writings of author Marjorie Kinnan Rawlings. Moving to Cross Creek in 1928, Rawlings wrote stories that exposed her fondness of rural life at ‘The Creek’ often including characters based on her relationships with her neighbors. Her most famous book was the Pulitzer Prize winning novel The Yearling, published in 1938. Some of her other popular works are Cracker Chidlings, Jacob’s Ladder, South Moon Under and Cross Creek. It was the success of Marjorie Kinnan Rawlings‘ books that put the quaint town of Cross Creek on the map! 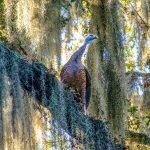 Location: Cross Creek, is located in southeastern Alachua county, is 16 miles southeast of Gainesville Florida. 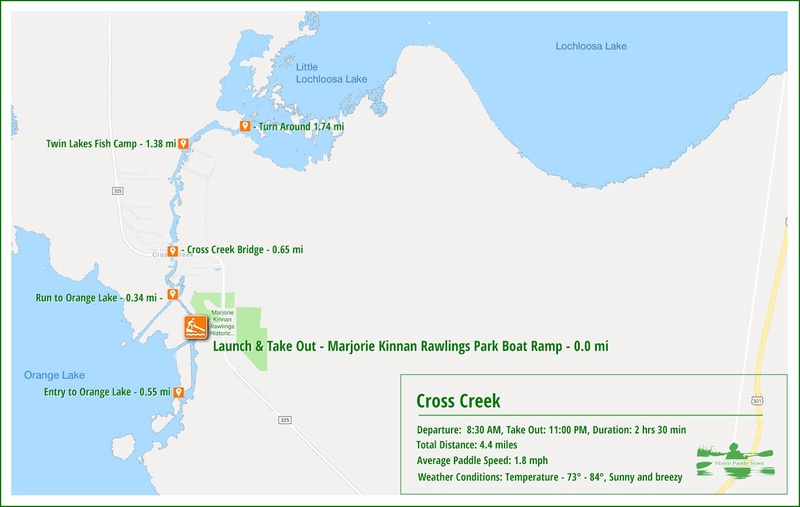 Launch/Take Out Point: The launch and take out for this paddle was the boat ramp at the Marjorie Kinnan Rawlings Park, 29°28’47.32″N, 82° 9’40.85″W. Paddle Distance: Launching at the park, paddling to and up Cross Creek then returning is 3.4 miles. I made an additional paddle South and entered Orange Lake which added another mile. Average Paddle Time: 1.8 mph. Current – Tidal: The river ‘flows’ from the North to the South with very little current to speak of. 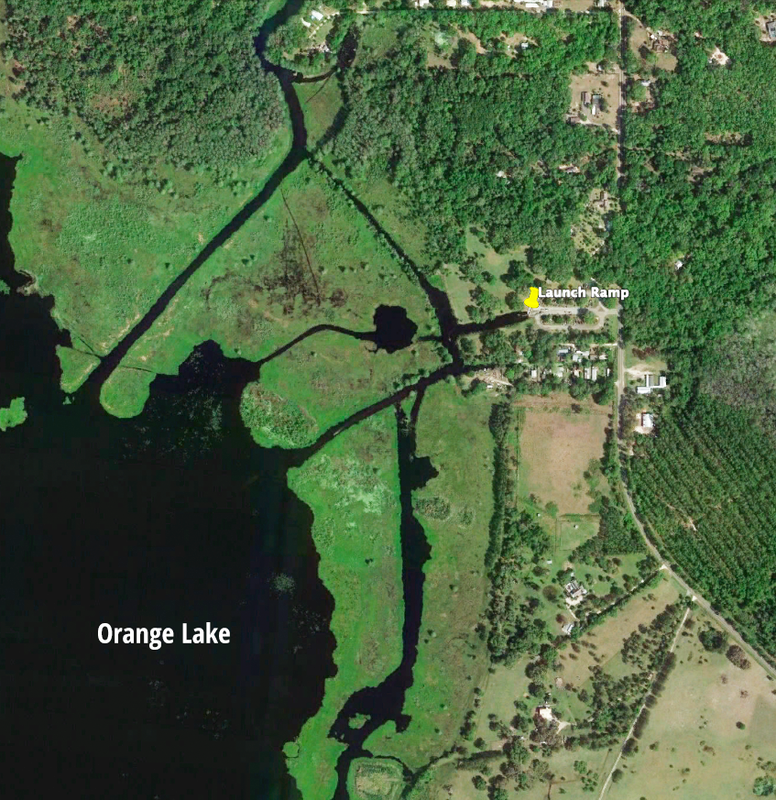 Overflow from Lochloosa Lake creates Cross Creek and flows into Orange Lake. Side Paddles: There are side paddles at Cross Creek. 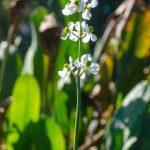 On the North end is Little Lochoosa Lake and Lochloosa Lake with a wide expanse of marsh land to explore. On the South end is Orange Lake with several choices to reach the lake from the launch. Rest Areas: Restrooms available at the launch at Marjorie Kinnan Rawlings Park. 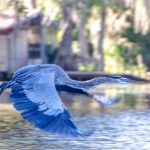 Having been off the water for a couple of weeks, I decided to drive on over to Cross Creek, do a short morning paddle and also check out Orange Lake. 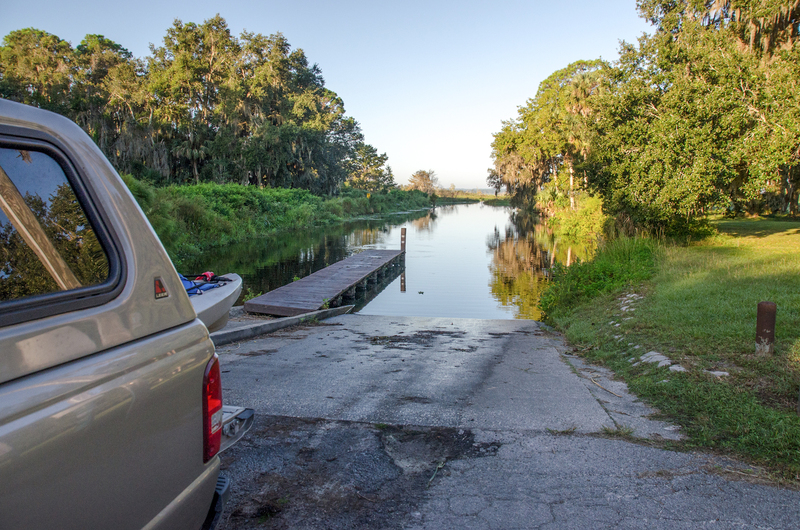 The launch, located at Marjorie Kinnan Rawlings Park, has two concrete ramps with an accessible dock between them. The water level was similar to my last paddle back in 2017, the weather was a warm 73° and the breeze was building off of Orange Lake. 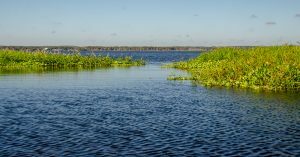 The waterway at the launch is man made, about 70′ wide and 450′ out to the ‘intersection‘ where I have the choice to continue straight and meander out to Orange Lake, make a left that takes me 1/2 mile South also to Orange Lake or make a right, paddle 1/4 mile on a small 35′ wide, very shallow, man-made canal that takes me to Cross Creek. I actually like this little canal, lined with Bald Cypress, Maples and assorted aquatic plants. There is a small weir along the western side of this canal to help maintain it’s integrity. The above photo is the canal as it looks leaving Cross Creek and paddling southeast to Orange Lake. It was no more than 18″ deep with a very muddy bottom on today’s trip. Entering ‘The Creek’, as residents call it, is a peaceful experience. 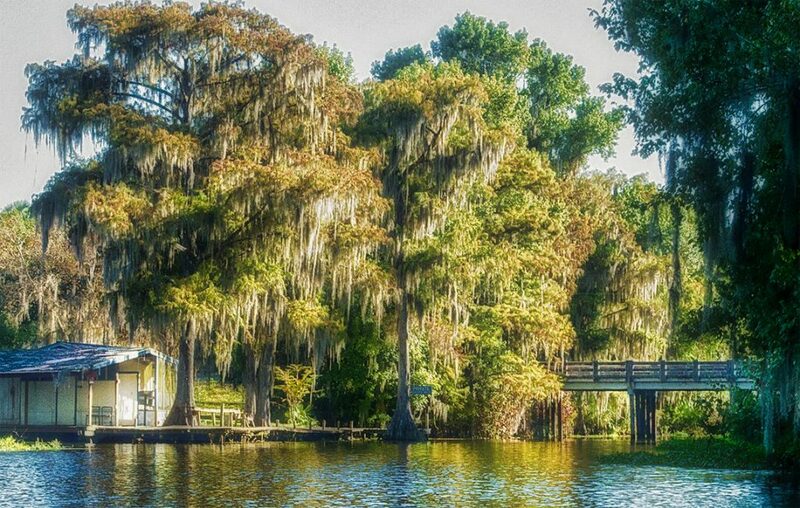 The air cools and the shoreline hosts beautiful Bald Cypress, Maples and Oak. A breeze blows through cooling the warm air. This is the creek of Marjorie Kinnan Rawling’s fame, whose writings and Pulitizer Prize for The Yearling turned a once quiet hamlet into a popular destination for many. 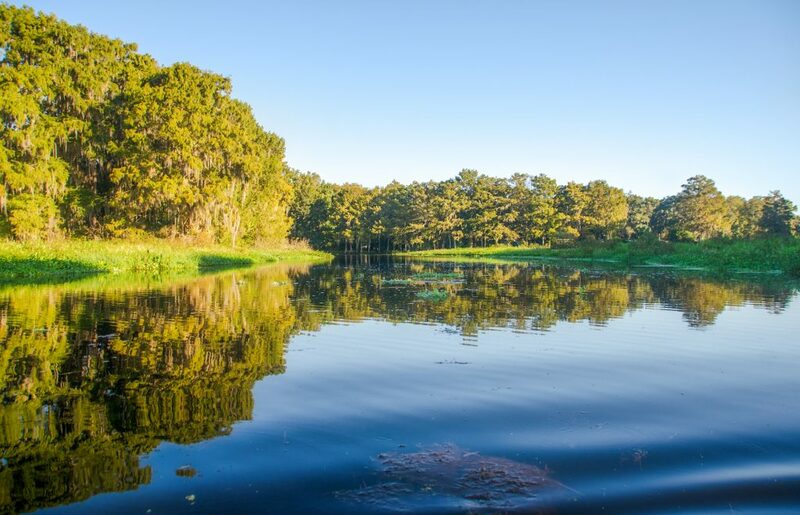 Cross Creek is only one mile long and I enter it from the southern end where it flows into Orange Lake. 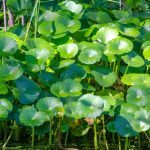 Over the years the proliferation of invasive aquatic plants have extended the open water line out almost a quarter mile from the original shoreline. There is a noticeable silence as I paddle with a slight breeze to my back. It is still early morning, the sun has yet to make a presence through the tall trees and I have yet to see any birds. I pass several quaint homes as I near the bridge where CR 325 crosses the river and within 500′ after passing the bridge the houses end. 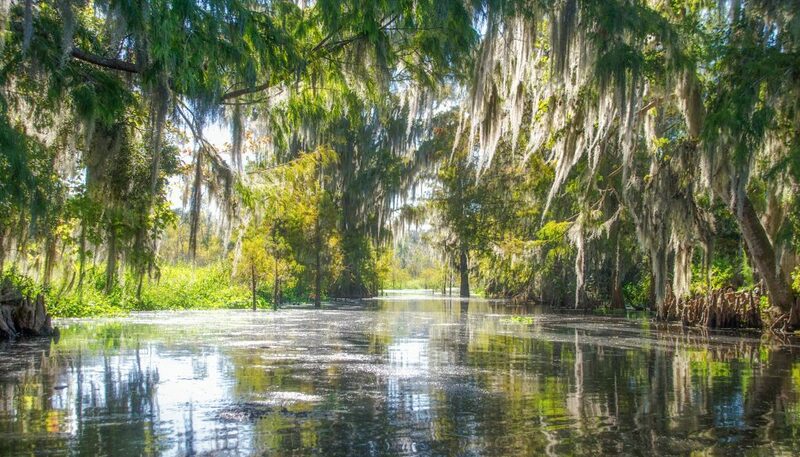 For the next half a mile I paddle with tall thick Cypress to my right and a more open shoreline, thick with aquatic plants on my left. The sun was now illuminating the western shoreline, while filtering through the Cypress to the East, apparently still too early for any birds. 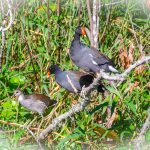 By the time I reach the ‘mouth’ of Cross Creek at Little Lake Lochloosa the sun is up and the birds are becoming active! Little Lake Lochloosa is an expanse of floating tussocks, thick vegetation expanding from the shorelines, and broken limbs and shrubbery jutting above the surface. The depth here is barely 18″ and I choose to turn around. On my return paddle, Cross Creek came alive. The temperature was in the low 80’s, the sun was up high enough to lighten 2/3’s of the creek. Colors became more vivid and birds were now active. 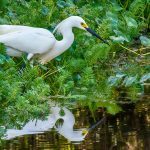 Blue Herons and Great White Egrets criss-crossed the creek majestically. 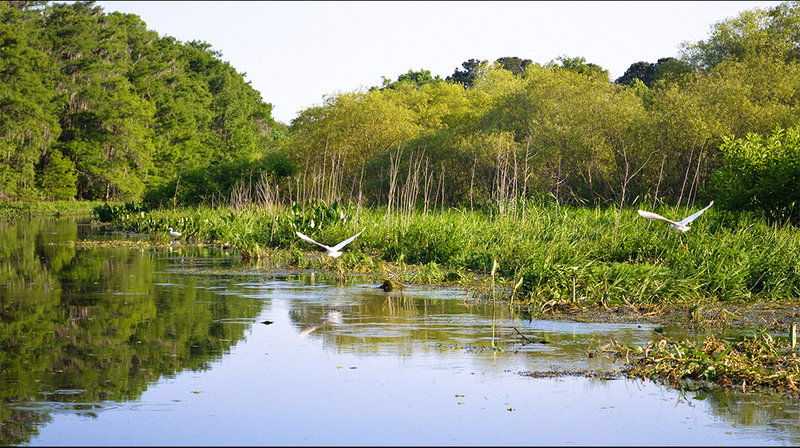 Along the shoreline in the thick vegetation, families of Moorehens sounded alerts as I paddled by. I wasn’t fortunate on this trip to catch site of a Bald Eagle that I saw on a previous trips. 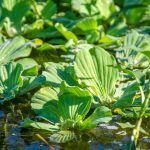 The floating aquatic plants were lush and many in bloom, Pickerel Weed, Wild Rice, Monkshead, Water Hyacinth, Duck Potato and Primrose. 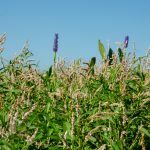 Invasive plants were abundant as Wild Lettuce, Hyacinth and Dollarweed intermingled along the shore, forming large barriers to the distant tree line. Willows caught my attention as many were bare, many dead and many sparsely leafed out…not sure why. It was a pleasant trip back down The Creek, paddling in an out of the sun as the morning warmed. Leaving Cross Creek I re-enter the canals that lead to the take out as well as access to Orange Lake, There are several choices to reach the lake and I decided to go South, past the launch access and explore my options there. 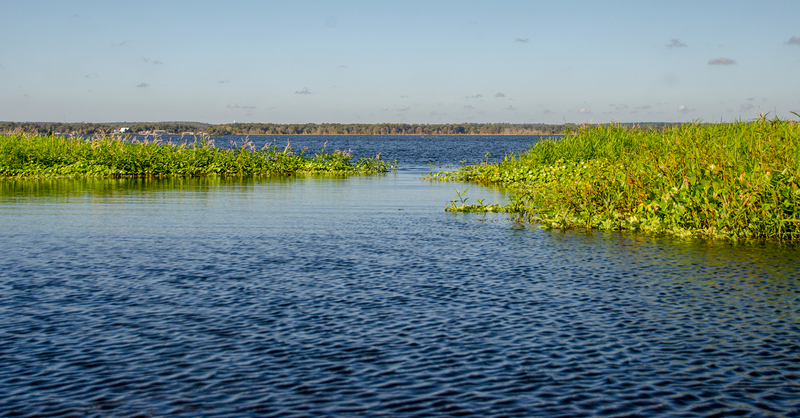 By now the wind is getting brisk as it comes off of Orange Lake, buffered only by the thick floating vegetation. 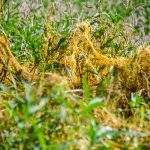 Within a half mile there was a very small opening in the weeds and I choose to make my entrance onto the lake from there. Wow! This really was my first time to witness that much water on Orange Lake! 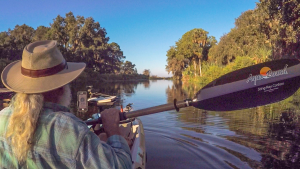 I enjoyed the view and with the wind now at my back, I returned to Marjorie Kinnan Rawlings Park, ending another chapter of Florida Paddle Notes. JT Glisson grew up just down the road from Miz Rawlings’ house. His book, The Creek, gives wonderful description of life in Cross Creek. He also illustrated the book. Thank you for that insight Moonflower. I will have to check out that book! Thoroughly enjoyed this! Thank you, James, your writing style is easy to read. That, along with the stunning photos, make a lovely vicarious visit to Cross Creek from my living room recliner! Makes me want to go there sooner than later. Worth, glad to introduce you to a lovely place!